A group of students from Padjadjaran University became finalists of Indonesian Student Entrepreneurship (KMI) Expo VIII held by the Ministry of Research, Technology and Higher Education at Pontianak State Polytechnic, West Kalimantan, last 22nd – 25th November 2017. “Calm’en Perfume” business group as the result of student collaboration from some faculties successfully represent UNPAD in KMI. This event is participated by more than 100 universities in Indonesia. The business group consists of Arif Rahman Jaya (FTIP), Sammy Alva Aditya (FTIP), Andrian Solehudin (Fapet), Rifky Amrullan (FTIP), and Ketut Widi Artayasa (FISIP). The perfume is produced from the conversion of the local essential oils through the distillation process and the fractional distillation vacuum. Essential oil is chosen as the materials of their product with the aim to encourage the welfare of farmers of essential oil (citronella oil) in Indonesia. So far, farmers of lemon grass as the raw materials of essential oil are considered to have no significant progress on their harvest. Patchouli oil as one of the many essential oil commodities is mostly exported overseas. The product is then processed into a derivative product and imported back Indonesia with a high selling price. Through the initiative of “Calm’en Perfume” group, they make social business model by targeting the farmer’s welfare. 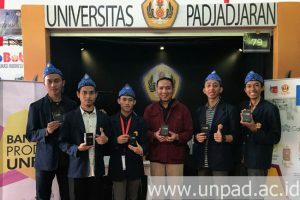 The development of their products has received good mentoring from Prof. Dr. Unang Supratman, M.S., as Professor of Faculty of Mathematics and Natural Sciences and Head of Unpad Central Laboratory. In addition, the team is also assisted in the field of activation and business development process from the lecturer of FTIP Unpad. Dr. Dwi Purnomo, M.T. Until now, “Calm’en Perfume” has been tested in the market. Public response to this product is fairly good. This product can be an alternative local perfume products in a good quality. The series of KMI events have been conducted since last year. The product “Calm’en Perfume” together with the business group “Janaka” and “Kosetratop” managed to get financial support from KMI 2017 to realize their concepts. The three business groups are then monitored by Kemenristekdikti. As a result, Arif and his friends had the opportunity to progress in the 2017 KMI Award in Pontianak as the finalist. In the event, the team conducted the exhibition and final selection for the best title of entrepreneurship category and exhibition booth. However, UNPAD team has not managed to bring the best title at the event. Although not already yet tobe the winner, the business concept related to this discipline must be continuously improved in UNPAD environment. “In the future, the integrative concept of multi-discipline, the researcher’s colaboration, and the earnest facilitation can make Unpad excellent in creating new businesses. Then the process is well listed in the publication in order to become the latest source of scholarship,” said Dr. Dwi. Furthermore, Dr. Dwi states that any endeavour that raises various commodities has added value. In addition to increasing the potential of commodities, businesses on this basis also contribute to improving the welfare of farmers. Reflecting from the efforts made at the KMI event, Dr. Dwi said that UNPAD must prepare the student business potential well. According to him, this event is a reflection of curriculum held in every college.